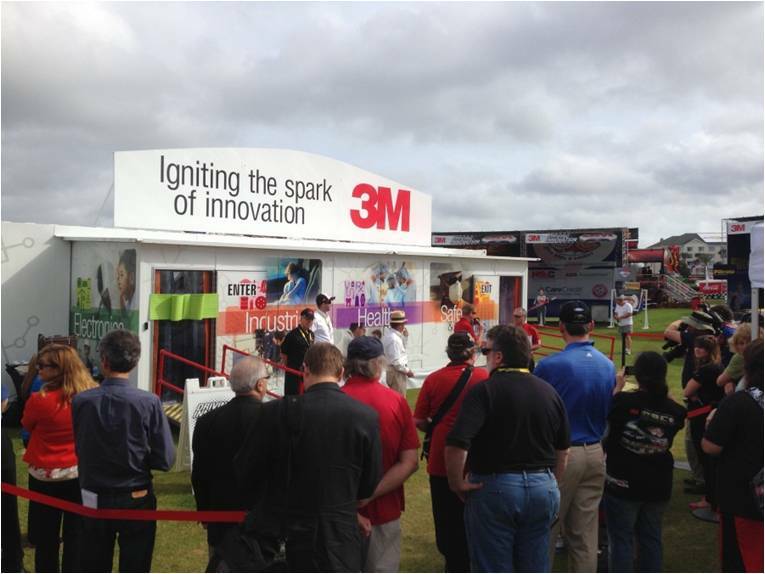 3M wanted to take their exhibits to trade shows, convention centers and sporting events, each a unique environment. In order to educate and introduce consumers to 3M products, they needed marketing events that could fit in any venue their customers were found. First, from a sports and entertainment outlet, we expanded on their sponsorship in NASCAR, both through large scale activations at select NASCAR races, but also through multiple Simulator cars which traveled the US working events such as retail store appearances, as well as Industry trade shows. We created a costumed mascot in order to better engage with audiences. Deebo the Bull was able to put a memorable face on familiar brand, sparking everyone’s interest. At track setup included 53’ Mobile Trailer, large 15’ tall tents, Deebo, computerized registration center, and a scramble screen prize wall. Next, we created the Mobile Innovation Pod. It was expandable to better work in both indoor and outdoor venues outside of the NASCAR world. It showed off the latest technology 3M Innovation had to offer. Of course, every event was staffed by a team of 25+ expert Brand Ambassadors who were able to explain new products. We created thousands of impressions of 3M, safeguarded valuable customer data for the client’s analysis, email marketing, demographic studies, etc. All meant to deepen the relationship they have with their customers.